Eric Castner, (pictured above), shared his father's wonderful story of heartbreak and healing through the process of organ donation. His father, Paul Castner, at 82 years old gave the gift of life. April is National Donate Life Month, and LifeShare is celebrating the donors who selflessly give the gift of life. The federally designated organ procurement organization is responsible for organ and tissue donation statewide. Orlowski said people should not disqualify themselves because of age or past medical conditions. “Medical professionals will decide if your organs are viable for donation,” he said. Paul raised his family the good-old-fashioned way, he expected character, integrity and hard work out of his sons. He built his family with faith in God, and his sons passed those same qualities of faith, character and integrity to their kids. When people would ask Paul how he was, he would tell them that he was “Making a Shadow,” his optimistic way of saying the sun is shining. On a cold day in January, one of Paul’s sons and his wife went to visit him. While they were enjoying conversation, Paul unexpectedly suffered a brain bleed. He was quickly taken to the hospital and stabilized. However, there was no sign of recovery for Paul. 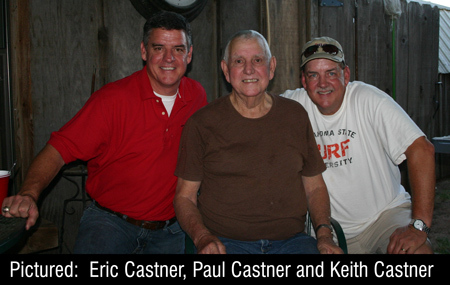 At the hospital LifeShare approached the family asking to speak with them about their father’s final wishes, Eric Castner recalled. Paul had been a registered organ donor. He saw it as a great way to give back and leave a legacy. Later, they learned that Paul’s liver was extremely healthy for his age. After talking to LifeShare staff, the family learned surgeons would be flying across the country to bring the gift of life to a patient who had been waiting on a phone call to receive an organ that would save them. The family learned that the father and grandfather who raised them to live with integrity and character was giving someone the gift of life. Together, they had something tangible to hold onto as Paul’s final statement. “My dad not only made a shadow for his sons and our families, but also made a shadow for a man in his 60s who is a husband, father and grandfather by making a final statement of character through organ donation,” Castner said. Paul’s family had no idea organ donation would also benefit them. When the family felt that they were just entering the grieving process, they quickly learned that their decision was also the first step to begin the healing process. Across the United States, more than 121,000 individuals wait for an organ transplant. Thousands more are in need of tissue and corneal transplants to restore mobility and sight. Without the generous gift of more than 24,000 donors in the United States per year, many would still be waiting for a lifesaving gift. Register to be an organ, eye and tissue donor at www.LifeShareRegistry.org. For more information about LifeShare, visit www.LifeShareOK.org.